BARCELONA, Spain--(BUSINESS WIRE)--(Mobile Media Summit) – Over the past 12 months, unsuspecting MasterCard cardholders from around the world laughed, cried and smiled as Priceless Surprises made their day. Priceless Surprises, the company’s new marketing platform to surprise and delight consumers, has become a global hit with more than 25 countries from every major region around the world launching it successfully; nearly 200 activations complete across key consumer passion areas like sports, music, fashion and shopping; and hundreds of thousands of surprises delivered to MasterCard cardholders to date, MasterCard announced today. Priceless Surprises is among the highest social media engagement generating initiatives live today, beating U.S. Twitter benchmarks within financial services and Facebook benchmarks across consumer industries. 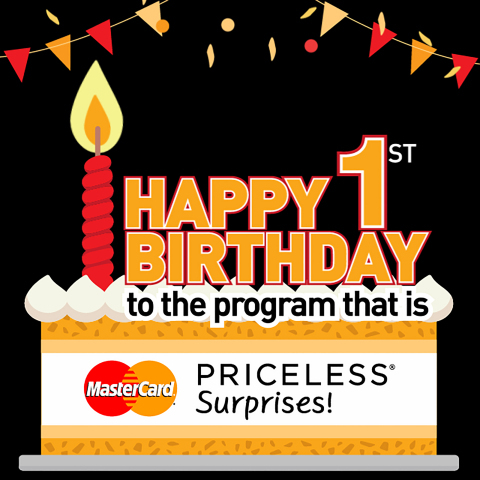 When compared against other MasterCard programs, Priceless Surprises engagement rate is three times higher. Since its debut at The GRAMMYs in 2014 with Justin Timberlake, music artists like Gwen Stefani, Pharrell Williams, and Usher; sports stars from hockey, baseball, soccer, rugby, and golf like Doug Gilmour , George Brett, Victor Ikpeba, Martin Johnson and Tom Watson – to name a few - have all delivered Priceless Surprises. Surprises have happened in unexpected places like at 30,000 feet in the air, at the top of the London Eye, and even the most unsuspecting local restaurants and classrooms. The concept is simple, just by using their MasterCard, cardholders can get surprised in big and small ways. From digital song downloads, to instant seat upgrades at events, to meeting world class entertainers and athletes, and so much more. Priceless Surprises has been integrated into many of MasterCard’s sponsorships including The GRAMMYs, The BRIT Awards, UEFA Champions League, Major League Baseball, PGA TOUR, and Rugby World Cup. Looking ahead, MasterCard is working with Kiip to power a soon-to-be-launched Priceless Surprises App and Mobile Software Developer Kit (SDK). The mobile delivery platform will communicate with cardholders about Surprises events and opportunities through the use of mobile-push notifications along with relevant in-app activities that are representative of real-world, real-time Priceless moments. “Kiip has connected with millions of consumers already through moment-based rewards," said Brian Wong, Kiip CEO. "We're excited to now partner with MasterCard for our Platform launch. MasterCard is the perfect partner to white-label our loyalty program and reach millions of additional consumers around the world. Together, we’ll define the next generation of consumer engagement and loyalty." Over the coming weeks MasterCard will launch the standalone app and will seek to integrate with some of its largest sponsorship partners around the world. “Through one surprise at a time, we aim to deliver Priceless Surprises at scale in a contextually relevant and real-time manner. We’ve pushed a lot of boundaries to date, but it’s the insights and mobile technologies available today that will get us closer to our goal of enabling delightful experiences for MasterCard cardholders,” Rajamannar concluded. Find a complete list of MasterCard’s news announcements from Mobile World Congress in our Digital Press Kit and follow us @MasterCardNews #WhatsNext to join the conversation. MasterCard has been consistently ranked among the top global brands by Interbrand. Launched in 1997, the award-winning Priceless advertising and marketing campaign has run in 53 languages in 112 countries worldwide. The ongoing success of Priceless is testament to the brand’s ability to evolve with today’s connected-consumer - driving greater engagement in addition to awareness, while not losing its rich heritage. Rooted in an emotional connection to things that truly matter, Priceless today is guided by its brand positioning to ‘connecting people to Priceless possibilities,’ and has been extended to included Priceless Surprises, Priceless Cities and Priceless Causes. MasterCard (NYSE: MA), www.mastercard.com is a technology company in the global payments industry. We operate the world’s fastest payments processing network, connecting consumers, financial institutions, merchants, governments and businesses in more than 210 countries and territories. MasterCard’s products and solutions make everyday commerce activities – such as shopping, traveling, running a business and managing finances – easier, more secure and more efficient for everyone. Follow us on Twitter: @MasterCardNews, join the discussion on the Beyond the Transaction Blog and subscribe for the latest news on the Engagement Bureau.